Commends | This book was part of the portfolio Artists and Photographs, published under art dealer Marian Goodman’s imprint, Multiples, Inc. The portfolio, as described in the prospectus, represents „a new concept in editions – a miniature boxed exhibition. The works by nineteen contemporary artists reflect current involvements with and uses of photography to document a complex range of thought on time, space, activity, process, and idea.“ Artists represented in the portfolio are Mel Bochner, Christo, Jan Dibbets, Tom Gormley, Dan Graham, Douglas Huebler, Allan Kaprow, Michael Kirby, Joseph Kosuth, Sol LeWitt, Richard Long, Robert Morris, Bruce Nauman, Dennis Oppenheim, Robert Rauschenberg, Ed Ruscha, Robert Smithson, Bernar Venet, and Andy Warhol. The works (books, objects, prints, and other material) are enclosed in a 33 x 33 x 10.2 cm box. The First Edition (1970) was limited to 1200 copies for 195$. Also included is a catalogue with text by Lawrence Alloway. 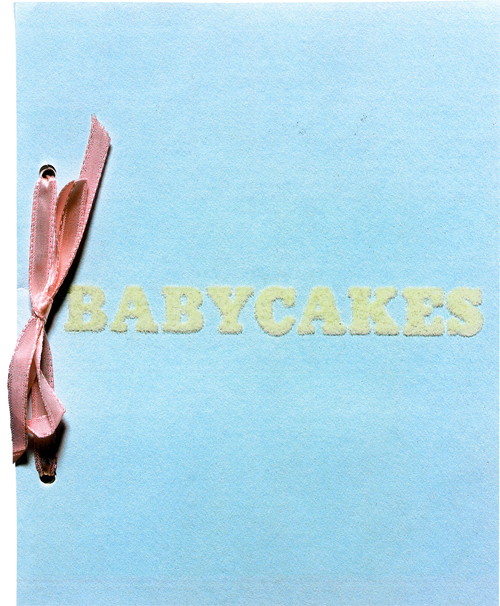 Photographs in Babycakes were by the artist and Elizabeth Claman, Sid Felsen, Jerry McMillan, and Danna Ruscha.